With modern products, changing your hair color is a simple process. Both men and women have truly embraced coloring in recent years, from highlights to full head recolors. Enzyme-based products combine the best of science and nature, meaning the hair can be nurtured at the same time as it is colored. Products have come a long way since the days when peroxide was used to bleach away color and strip the hair of its health. Many clients want to lighten their hair over the summer months, from a few subtle highlights to dramatic panel blocking – they want that golden, beach-kissed look. Conversely, many clients with move olive-toned skin use the summer months to go for lowlights, with darker streaks emphasizing their natural tones and creating a fuller, more textured look to the hair. Hair color can look fantastic when it is paired expertly with other factors in the client’s life, such as their skin tone, their preferred clothing colors and style, and so forth. It’s why it is so important to have an individualized consultation before making a dramatic change to your hair color – your stylist can help to guide you as to how natural or otherwise the color will look when it has been applied. 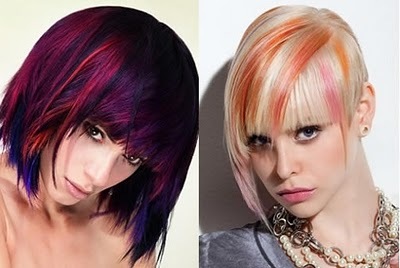 Many clients want to achieve a bold and dramatic look with their hair color. It’s not about choosing tones that look natural, but about creating a look that defines them and makes them stand out from the crowd. In those situations, a bit of creativity can work wonders. Very dark hair against pale skin, for example, can create a lovely, waif-like image, while bright blonde panel blocking over dark hair and dark skin can look extremely eye-catching. Adding a single streak of an unusual color can also create a dramatic look, such as an electric blue or cherry red streak against black hair. It doesn't have to be big – the boldness of the color will speak for itself. Whatever the client’s personal preference, modern coloring systems mean that every man and woman can now have their perfect hair color and style – even if their idea of what that is changes from one month to the next!